This is really neat. I have always wanted to be able to stay out later but when it gets dark so does the patio, so we always go back inside. This light saves the say two ways, the batteries are included as well as being rechargeable, and it brings light so we can stay out later enjoying the evening air. I love the wood look of this and how much light it gives out without being overbearing. It is a pleasant light not harsh. Easy to put on your pole and stays firmly where you need it. You can find this umbrella light on Amazon. 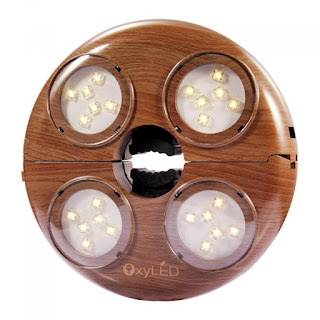 This 24 LED umbrella light is bright enough to allow you enjoying meals, playing cards or just chatting with family members or friends at night in outdoor patios. With detachable slotted rubber gaskets design, it can be adjusted to well fit for all umbrella poles with diameter 23mm-50mm without wires and tools. Using 4 rechargeable AA batteries, it is durable and convenient to use. It can also work as tent light, camp light or emergency light. Quick installation and release- one second! One year money back replacement guarantee!